I can really relate to what you're saying Tom. I find myself emotionally so invigorated yet worn down at the same time after these unforgettable experiences, that I cannot listen to LC for a while. If I do I am afraid for my emotional stability, and if I don't I am afraid to lose it too. There really is no way about it, but to attend more concerts if it is possible. sturgess66 wrote: That's a lot of people! No, that's us, Forum members and Croatian fans, in first row! Big THANK YOU to Mr. Mladen (Siple Events agency) for giving us best seats even until the last week! I would like to support Tomsakic in his thanks to Mr Mladen and Simple Events for the seats we were given. Attending this concert was a surprise birthday gift for my husband. So front row seats in front of Javier Mas were beyond anything I could have hoped for - my husband could hardly believe it. The concert was fabulous - Mr C was having a lot of fun with the band, even serenading in Spanish We have not been to a concert since last year - is it possible, but is Mr Cohen's voice even better???!!!! Ljubljana is a beautiful city, with lovely people - we felt very welcome. I hope to return for another visit one day. The concert last night on Canadian multifaceted artist Leonard Cohen, the new Hall Arena in Ljubljana Stožice enrolled in the global map popularnoglasbenih venues. Ljubljana - Exceptional musical poet, visited Ljubljana in the world tour, which has been going since 2008 and will be completed in early December in Las Vegas. Leonard Cohen was known and recognized writer, even before he started a music business, and literary creativity in the whole musical career. Even the debut Songs of Leonard Cohen in 1967 offered some enduring songs such as Suzanne, Sisters of Mercy, So Long, Marianne and Hey, That's No Way to Say Goodbye. In their texts, the Bible deals with such topics as human relations to a completely real and not very romantic point of view, but still with vedrostjo and faith in the wonder of human appearance. The concert was almost sold out. Ljubljana audience's love might (also) be because of his never depleted and regularly celebrated charm, boundless creative fitness indispensable praise of accompanying singers, a variety of instrumental support, tireless more than two hours of concert performances, all together, and yet something else. All of this has been well received audience at last night concert. In his just coming to the stage, the applause garnered respect, it is associated with a numerous group of musicians began with an introductory song Dance Me To The End Of Love. Debt concert in two parts has brought his many hits and some new ones in typical Cohenesqe refined interpretation. Visitors are captivated concert with his voice. Cohen is the author of several bestsellers that have become part of the world's musical heritage and an inspiration for many musicians. Unforgettable hits like Suzanne, So Long, and Marianne, already enumerated the debut Songs of Leonard Cohen in 1967. Cohen impressed the Ljubljana audience with songs Dance Me To The End Of Love, Hallelujah, First We Take Manhattan, Everybody Knows and I'm Your Man. Ljubljana - Before a full Stožice Arena on Tuesday evening enchanted monitor Leonard Cohen concert, who has proven to be in great shape. Initially, Cohen promised to keep the musicians gave the audience everything they have. Cohen has held promise. The concert, which lasted more than three and a half hours, was most impressive with the songs "Suzannne", "Hallelujah" and "I'm Your Man". The Cohen concert started exactly at the 20th hours. For the introductory song he chose "Dance Me To The End Of Love", and then followed with his many successes as well as songs that have the status of classics, but they are nevertheless typical "cohenovske. 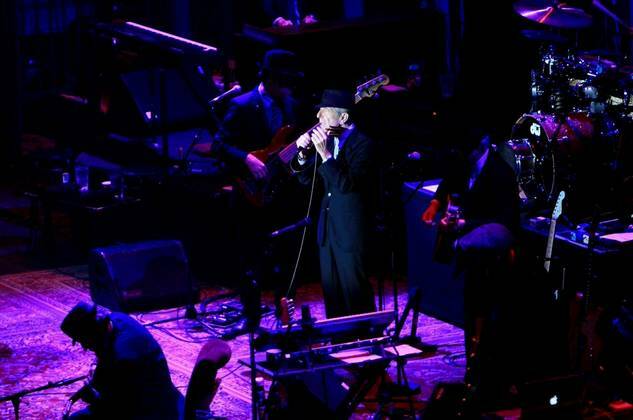 During the concert Cohen repeatedly thanked the audience, which is carefully and sometimes with quiet singing accompanied by a concert. As Cohen said, in a world full of chaos and suffering, a special blessing that is combined with the audience in such an event. Cohen, like the audience also showed great respect for his musicians. Among the instrumental solos or then or when they took a major role vocalists, he took off his hat, turned in their direction, they listened and ultimately bowed. After an hour and a half of performing he took a short break, followed by the second half of the concert. Cohen audience at the official, provided the work does not descend from the stage. Thus, a musician in a gentle way and the wave, he left the stage, but he soon returned. The last half hour concert Cohenovi fans of all generations are no longer sitting in their chairs. Finally, since Cohen's goodbye to a standing ovation. Cohen is touring for the first time in Slovenia. Judging from the responses of the audience were tickets on the day of the concert ranged between about 50 and 80 euros worth of your money. Uploaded by "MWeisso" - Thanks! "Leonard Cohen in Ljubljana (everything we got)" and partial of "Everybody Knows"
Halfabee - I just watched and was going to bring them over. Nice! Thank you! Uploaded by "manicnipoet" - Thanks! Uploaded by "sustah21" - Thanks! "I'm Your Man" - I *love* Leonard's melodic variation at 0:25 when he sings about "the beast" - - and the growly "pleeeeeeeeeease"
Uploaded by ? "SugarShitTrash6066" - Thanks! Uploaded by "Natasa982" - Thanks! "In Zagreb I recognized Tom from all the pictures posted here on the forum and wanted to go and say hi, but somehow I felt a bit out of place there - maybe I will do it in Ljubljana"
Your photos are beautiful MajaMaja! Thank you. I know the quality is bad - I wasn't close enough to the stage, but I also know you will all appreciate them anyways!